With a traditional look and strong design, this vanity will help any bathroom look nicer. With a black granite counter and white solid wood base, this product is good-looking and useful. Add a classic feel to your bathroom with this simple vanity set from Home Decorators Collection. This vanity is a great way to add modern style to your bathroom. Its comes with a nice black quartz counter and white plywood base for strength and style. With drawer and double-door cabinet, this vanity set is also great to keep items in. Bring a classic look and feel to your bathroom with this beautiful set from American Imaginations. Designed with a traditional style and strong build, this vanity is a perfect choice for any bathroom. With a black granite counter and white solid wood base, this product is good-looking and useful. Put away your bathroom items in the double-door cabinet. Put a nice twist on your bathroom project with this classic piece from Avanity. Use this vanity to bring more traditional style into your bathroom. The good-looking black granite counter and white solid wood base make a big difference in your bathroom. The double-door cabinet and drawers are great for putting away bathroom items. Put together your perfect bathroom with this stylish vanity set from Avanity. If you want a vanity that is both stylish and useful, this traditional vanity is perfect. The white ceramic counter and black plywood base make a beautiful look in your bathroom. The roomy double-door cabinet has lots of space to put bathroom items. Bring a classic look and feel to your bathroom with this beautiful set from Bellaterra. Ferngate 61-inch W 4-Drawer 4-Door Freestanding Vanity in White With Granite Top in Black With a traditional look and strong design, this vanity will help any bathroom look nicer. With a black granite counter and white solid wood base, this product is good-looking and useful. Add a classic feel to your bathroom with this simple vanity set from Home Decorators Collection. 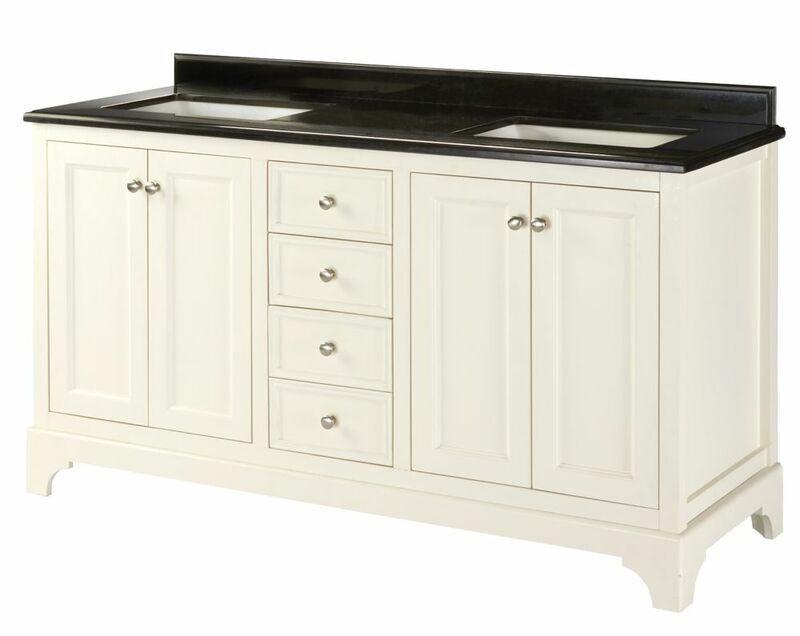 Ferngate 61-inch W 4-Drawer 4-Door Freestanding Vanity in White With Granite Top in Black is rated 4.8 out of 5 by 4. Rated 5 out of 5 by Gilles007 from Ferngate 61-inch W 4-Drawer This is an excellent product everything works great , fast delivery, everything is solid and very well made, packaging is very well done , great price compare to other similar product. I am glad I found this one. If you're looking for something like this you cannot go wrong. I would buy this again with out any hesitation. Rated 5 out of 5 by Yvonne from Bathroom vanity Color was perfect. Looks great with the black granite countertop. I love it and it is great value for the price. Rated 4 out of 5 by Breezy193 from Bathroom Reno complete! Very attractive vanity. Well organized for maximum storage. Good value. Rated 5 out of 5 by Bathroom reno from Perfect vanity Bought the vanity for our renovated bathromm and we are very happy with it. Lots of storage and the vanity itself is well made. Does the granite on this vanity need to be sealed? it's available by truck delivery only as it comes from BC. the backsplash is not built into the counter, it comes as separate pieces. we didnt use ours. Are the drawers soft closing? The measurements from the edge of the vanity to the center of the sink (or the mid faucet hole) is 348 millimeters, approximately 13.70 inches. It is equal on both sides.